Giving your baby colorful toys may not be enough to develop his skills. 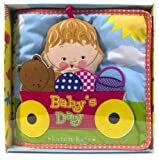 Soft cloth books add fun to your baby’s playtime and the engaging illustrations and the bold letters in the book make him familiar with the literature. Finding the best cloth books for babies is a very important task as what he will see, he will learn. Why Use Cloth Books for Babies? The cloth books for babies are the first step towards literacy. With the help of shapes, letters, colors and designs your baby recognizes the beautiful world around him. The regular books are hard and edgy and your baby can get hurt with it. Also, babies are mischievous and they can tear the pages of a regular book. Cloth books are completely safe. The best thing is they can be cleaned in a hassle free way. Cloth books last long and keep inspiring the babies. 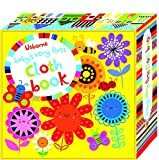 Here are some wonderful cloth books for your baby that may help you develop his very first literacy skills. Introduce your baby to the colors, shapes and sounds of animals, flowers and many other beautiful things. The book will bring your baby close to nature. Every time your baby presses a flower or fish, a surprising sound will come out of the crackling foiled placed inside the pages. You may not be able to keep an eye on your playing baby all the time. 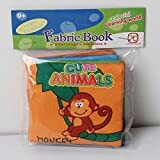 The cute animal cloth book keeps him engaged with the bright colors and shapes of animals and the soft cotton fabric of the book prevents him from chewing or tearing it. Bring home a new fun squad for your baby’s playtime and learning. Your baby will enjoy the surprising sound coming while turning the soft fabric pages. The product contains a fuzzy bee and his crazy insect friends. The morning to bedtime baby’s day cloth book invites you to join his fun chores. You can be a part of his adorable waking-up, share his fantasy breakfast, play hide-and-seek and hit the sack with a smile. It’s a great product for infants as well as slightly grown-up babies. When you are introducing the very first book to your child, make sure it’s an engaging cloth book. Embrace the light and inspiring teddy-themed cloth book. The book shows the everyday fun, playtime and bedtime regime of the cute teddy. Along with the engaging illustrations and texts, your baby gets a soft teddy that can be taken anywhere. Your baby gets an adorable companion for his playtime as well as bedtime. 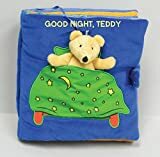 Whether you are moving out with your baby or spending quality time at home; the light cloth book can easily fit in a bag or adjust in your baby’s cradle. The bright colors, engaging images and textures develop literacy skills in your baby anytime and anywhere. The fabric cover of the book makes it light, easy-to-wash and safe to touch for babies. Wow easy way to purchase online Baby’s Clothes and many more things! Thanks for sharing this article.